Baan Saitara er en samling af 10 boutique villaer beliggende på en skyfri bjergskråning lige syd for Lamai Beach Koh Samui. Hver villa plads til 6 gæster og har tre airconditionerede værelser - 2 med en-suite badeværelser og 'Bali' brusere. Alle villaer har infinity pools med udsigt over en spektakulær udsigt over havet og er smukt indrettet i moderne thailandsk stil og fuldt udstyret med satellit-tv og WiFi til internetadgang. Bemærk: Da der er 5-6 villaer til leje i løbet af året, vil kalenderen viser tilgængelighed medmindre alle villaer er reserveret. Golf: Flere professionelle golfbaner til rådighed på øen inden for 15-20 minutters kørsel. PGA Santiburi 18 hullers bane 15 minutter væk. Andre Aktiviteter: Bungee Jumping, ATV huslejer, go-kart racing, elefant trekking, kajak, surfing, kitesurfing, dykning, ø-ture, ridning, slange gård, sommerfugl haven, klatring, biografer, shopping alle inden for et par minutter køre. 2 master bade omfatter marmor dobbelt forfængelighed og delvist udendørs bali brusere med vindue udsigt til havet. Belysning på lysdæmpere. 3. badeværelse i marmor med toilet og bad. Spacious and clean. Quiet and friendly staffs. Better have a car as property is on a hill. The view is good, and it's so cool to have your private cool.. Very nice and comfortable villa with a stunning view. Good location, nearby some good restaurants (ie the cliff) and nice beaches / beach clubs. We spent a very relaxing week. Nice vacation. Enjoyed the villa so much! We had a really unforgettable week staying at Baan Saitara. The villa we stayed at is Villa 2 and the sea view is fantastic. Open living area with everything you could ask for. Fully equipped kitchen that we can make our onw meal and enjoy a coffee or tea. The maids come to clean the villa every day which I found really nice. (I've stayed in some other villas on this island, not many can do every day house cleaning except for hotels) The swimming pool is very clean, they have a guy coming 3 times a week to look after it which we appreciated it a lot. The reason I like this villa so much is it meets all my needs: it's spacious, clean and well equipped, like your own home. It has maids, pool guy, a manager etc so i can reach all the services I need. (The manager Cat is always there to assist you, answering your questions and organizing car rental for us) it's in Lamai, a relatively quiet area, but with a car, you can go anywhere on this island (the island is not big and roads are not complicated, most attractions are not far to drive to. this areas have two big supermarkets, some night markets, some very nice restaurants and cafes etc). And the price is quite affordable compared to the villas those providing similar services. Would def come back. Stayed at Baan Saitara for about 2 weeks in December with 4 adults and a 2 year old toddler. Stayed one week in villa 4 and the remainder in villa 8. 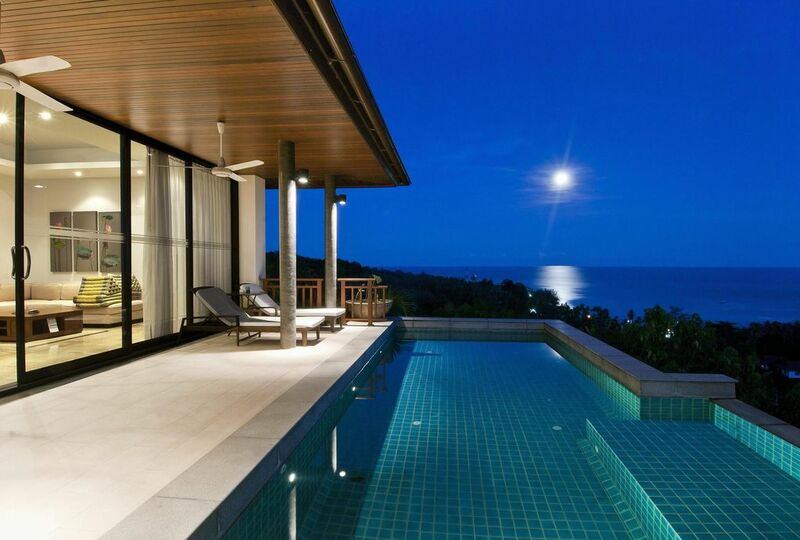 Absolutely gorgeous villas with stunning south east views of Koh Samui. Both Villas are spacious, clean and luxurious…we were often content just relaxing and enjoying the villa making occasional trips into Lamai area for supplies and food. The villas are of quality construction and nicely renovated each with its own private pool overlooking the beautiful vista. Villa 4 is a bit smaller (3 rooms) and simpler while villa 8 is larger with four rooms and better furnished (kitchen with large island, entertainment systems, network printer, desks, nice traditional thai art, etc.). The only downside to villa 8 is that it is situated higher on the hill which means you need to take a flight of stairs to reach it. On the other hand, with Villa 4 you could park your car directly at the front doors. Each villa is fully equipped with everything you need. From nice wide screen TVs with 100s of English and Asian channels, fully equipped kitchens, and all the towels, bathrobes and linens you need; to comfortable couches and beds for relaxing and sleeping. The villas also have good wifi coverage. At first the wifi and one of the air con units (for the living room) were not working well when we initially checked into villa 4. Ricky took care of these problems right away and had them both fixed by the next day. Villa 8 actually had very goof wifi and had three access points just for that villa. Very kid friendly and safe environment for my toddler. The villas are situated high amongst the hills so a car is really a must have (and easily arranged through Kat or Ricky). Villas are cleaned daily as well as the pool and staff are friendly and nice. Ricky and Kat are fabulous hosts and always available to assist. They really go out of their way to make sure you stay is as comfortable and enjoyable as possible. We were provided free transfers to and from the airport. They also provide you with a local cell phone for convenience and so that you can contact them at anytime. I highly recommend Baan Saitara for your Koh Samui experience. Just like another reviewer mentioned, I almost don’t want to give this rave review in case it makes it harder for me to book in the future. This is definitely a little hidden gem and a great value. As a business traveler I have stayed in some very nice hotels around the world, but I have to say that staying here was one of my most memorable and satisfying experiences. The villa is situated away from the bustle of Lamai and Chaweng yet only a few minutes drive to experience those areas when we wanted. The villa was a beautiful beautiful, spotless and extremely comfortable and had top of the line finishings? The pool was incredible and we spent many hours enjoying it. The views from the villas are amazing and we could not stop taking pictures of the sunrise and how the sea changed colors throughout the day. Ricky and Cat were very attentive and helpful and the other staff was incredible and attended to our every need. I could go on ad infinitum on the merits of this villa but will just say that we couldn't have been happier staying here. Thanks to the staff - well done! Lamai er en rolig by med en række fremragende restauranter og strandbarer samt et spændende natteliv. Nyd antikke og kunsthåndværk shopping, kurbade og en række aktiviteter. Lamai er kun 15-20 minutter til Chaweng stranden og lufthavnen og adskillige minutters kørsel til en række mere afsides strande. -Since there are 10 villas for rent during the year, the calendar will show availability unless all villas are reserved. -Rates are based on the use of 3 bedrooms . -If you have a smaller party and only require 1 to 2 bedrooms, then please contact us for the possibility of a reduced rate.